Well, well, well. It’s that time of the year when our spending goes up and our eating goes down the tubes. I get it. I really do. In fact, I’m probably right there with you. But while I’m indulging in more decadent food than I usually do, I still try to make sure I’m eating lots of healthy things as well. The junk isn’t necessarily replacing the good stuff it’s just in addition to the extra treats. To keep up on the healthy eating, I’m making sure I keep lots of convenient healthy foods on hand that are easy to prepare. Like these Culinary Cuts Cauliflower Cauliettes from Mann’s Fresh Vegetables. You know I love me some cauliflower as witnessed by my Pineapple Fried Cauli Rice, my Paleo Chicken Enchiladas (yes, they’re stuffed with cauliflower too) and my Grain-Free Paella. But you know what I DON’T love about cauliflower rice / cauliettes? The gigantic mess I always create when making it. I mean, that cauli gets everywhere. Even if I’m making it in the blender. It’s become pet peeve of mine. I’m pretty sure the next owners of the house will find pieces of cauliflower embedded into the walls and floors somehow. HOWEVER! No longer. These Cauliflower Cauliettes are literally the easiest, most mess-free way to ever make cauliflower. 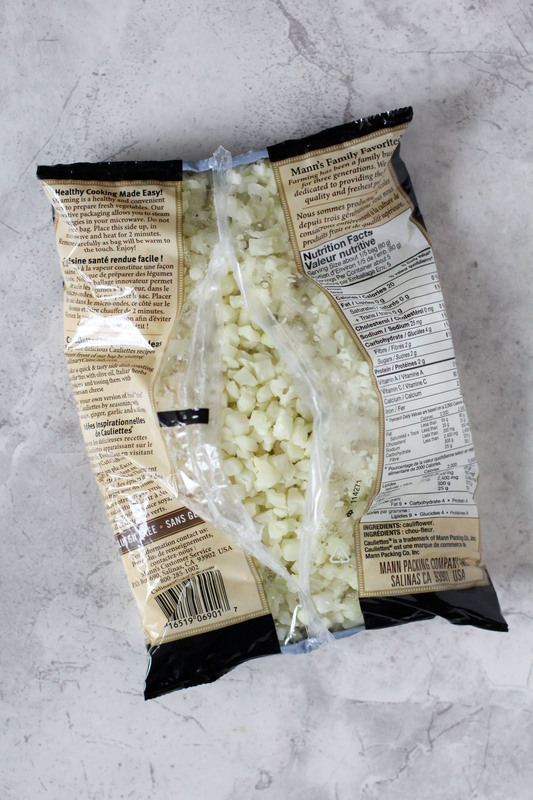 All you need to do to prep and cook them is place the entire bag in the microwave and cook them for about 2 minutes. The bag vents itself, the cauliflower cooks and you’re done. How amazing is that? No mess, no problem and you’re left with the perfect veggie “blank slate” to create an amazing and healthy dish. I also want to address that these cauliettes are cut slightly differently than cauliflower rice. The pieces are a bit larger and more substantial which I find prevents it from becoming soggy. If you make your cauliflower rice too fine you’re going to end up with cauli mash. Don’t get me wrong, I love cauli mash but it’s not appropriate for all recipes that require a your cauliflower to be a bit more substantial. Such as this one. 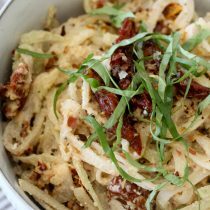 For this recipe I really wanted to create something so delicious and easy enough that it becomes a staple at your dinner table. Because it’s also the holiday season I wanted to create a dish that felt festive. I mean, can you get more festive than green and red? I think not. This dish couldn’t be any easier to recreate if I tried. Here’s the quick of it. 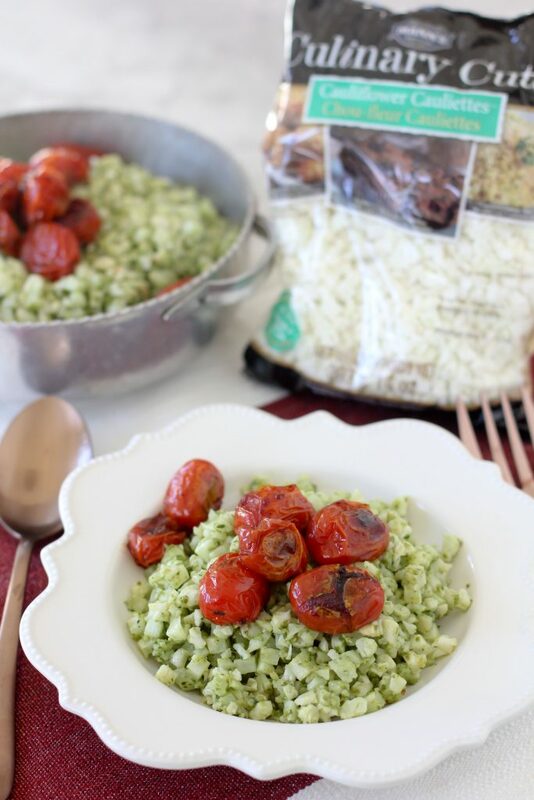 You microwave your cauli cauliettes, add your favorite pesto (i.e. MINE), blister up the tomatoes in a hot pan and add to the top. 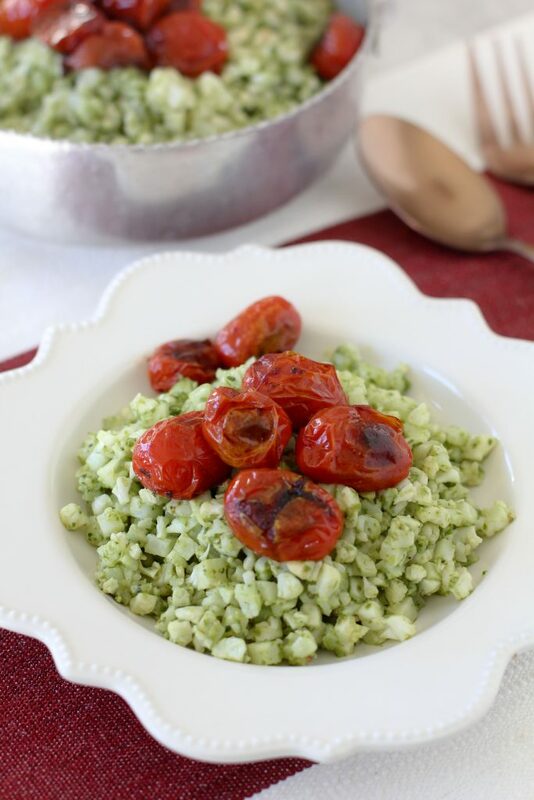 For your pesto, I recommend you use my Paleo Pesto recipe. I really was’t joking when I said, mine. lol It’s even Whole30 compliant for you, thus making this entire dish Whole30 compliant. 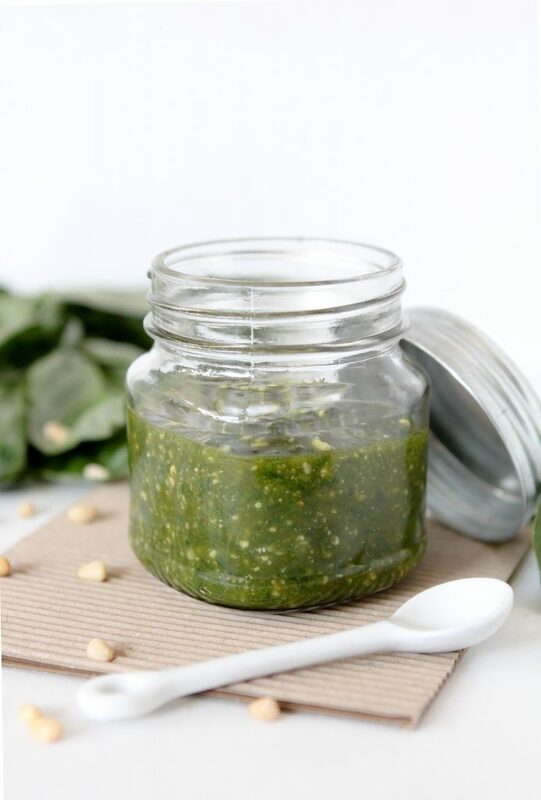 If you think there’s no way that a dairy-free pesto can be as tasty as it’s counterpart, you are oh-so mistaken my friend. If you’re interested in making this a full meal and adding a protein, I suggest you add some rotisserie chicken and a tad extra pesto and you’re good to go. Not only is this dish crazy easy to make for your day-to-day dinners, it makes a great holiday side. I don’t know about you, but preparing holiday meals is always a three ring circus in my kitchen. All that I seem to be missing is a giant nose that honks and corresponding giant clown shoes. Timing a zillion dishes to be done at the same time is no easy feat and I’m left zipping around the kitchen like a lunatic. 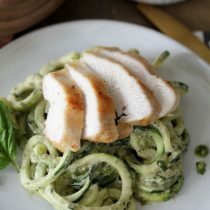 Fortunately, you can make your pesto ahead of time and the remainder of this dish will take you a total of 10 minutes. This last Thanksgiving I had so many people tag me on Instagram in recipes of mine that made it to their Thanksgiving dinner tables and it made me feel like a million bucks. I even had someone tell me ahead of time that they didn’t like turkey and were going to make my Whole Smith’s Whole Roasted Chicken instead. Well, she did and her entire family raved about it. In fact, they’re planning to use that recipe for all of their Thanksgivings moving forward. How special is that?? The feeling of knowing you’ve created something that anyone deems worthy enough to make it to their family’s holiday meal is so special. 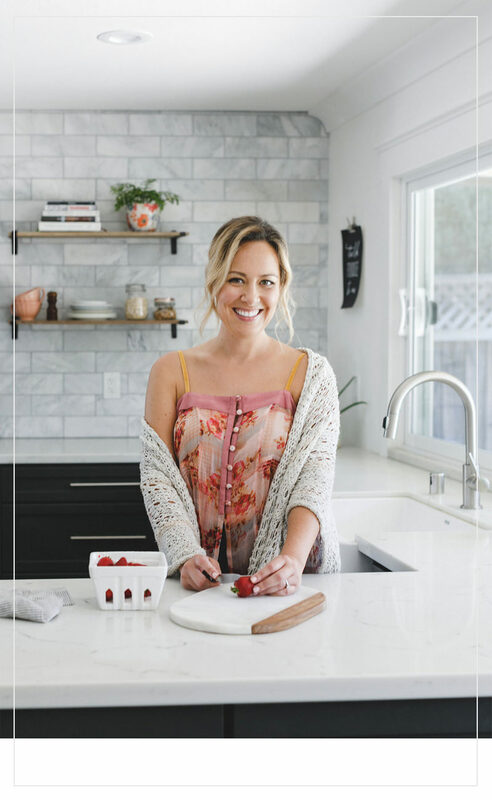 I find so much pleasure in creating recipes that make healthy eating not only easy for you but more importantly, delicious. Because trust me, if eating healthy isn’t something we enjoy and find tasty no one’s going to want to do it. 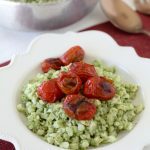 With all of that being said, I think you’ll really love the convenience and easy of these Culinary Cuts Cauliflower Cauliettes and I think you’ll find the addition of the pesto and blistered tomatoes incredibly tasty. And dare I say worth of an appearance at your family’s next gathering? Mann’s is also hosting a Pinterest contest where you can Pin your favorite holiday Culinary Cuts dishes dishes and win a $250 gift card! Hop over to HERE to check it out! 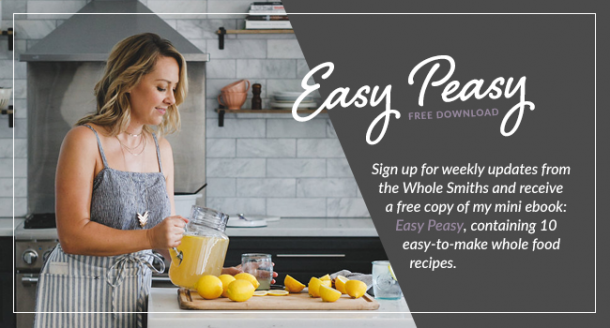 An easy-to-make Pesto Cauliflower Rice recipe from the Whole Smiths! 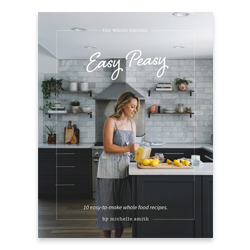 Paleo-friendly, vegan, vegetarian and Whole30 compliant. 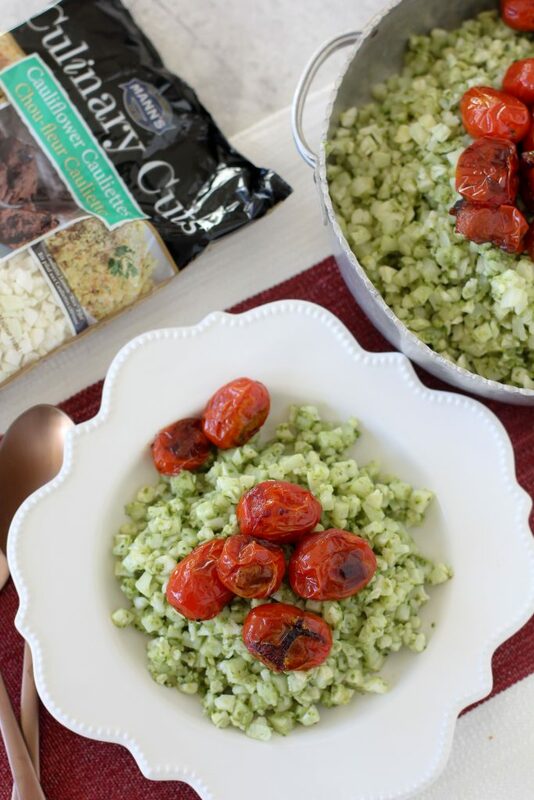 This pesto cauli rice looks incredible! 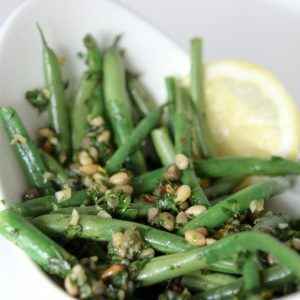 Such a great quick and easy side dish that everyone will love! Riced caulk is the best low cab sub! Thanks for sharing this recipe – this recipe looks great – where can I buy cauliflower cauliettes? Their website doesn’t seem to show retail locations, nor does it have an online store? I’m in New York City so I can get most things here but haven’t seen these cauliettes anywhere.